Astrophotographer Jeff Berkes captured this Lyrid meteor in the marshlands of southern Maryland on April 14, 2013. The Lyrid meteor shower peaks tonight (April 21) and if Mother Nature spoils your "shooting stars" display with bad weather, you can watch the celestial light show live online with two webcasts. The annual Lyrid meteor shower occurs every year when Earth passes through debris left behind by Comet Thatcher, which makes a full orbit of the sun once every 415 years. At its peak this year — which is expected to happen in the pre-dawn hours Tuesday (April 22) — the Lyrid shower should produce about 20 meteors per hour. 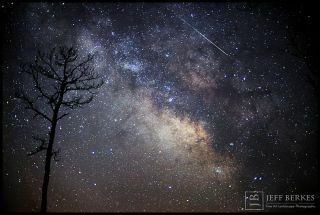 You can watch the Lyrid meteor shower webcasts on Space.com via the online Slooh community telescope and NASA. "Best viewing will be midnight until dawn on the morning of April 22, provided you have clear, dark skies away from city lights," NASA officials wrote in a skywatching advisory. "Northern Hemisphere observers will have a better show than those in the Southern Hemisphere." Learn more about the annual Lyrid meteor shower. Image uploaded April 21, 2014. The Lyrid meteor shower has been observed for nearly 2,600 years. Chinese astronomers were the first to record the meteor display in 687 B.C., Slooh representatives said in a statement. "This is not one of the top meteor showers of the year like the Perseids and the Geminids, still the Lyrids produce around 20 meteors an hour, and they are moderately fast — coming in at 110,000 miles per hour," Slooh astronomer Bob Berman said in a webcast advisory. "That's about 30 miles per second, which is nearly 60 times faster than a rifle bullet." Stargazers in dark areas with clear weather could see some meteors. But the waning gibbous moon will probably wash out most of the show this year, meteor shower expert Bill Cooke of NASA told Space.com. "I would not set high expectations," Cooke said. Lyrid meteors appear to emanate from the star Vega in the constellation Lyra, the Harp. Meteor showers are created when pieces of space debris strike Earth's upper atmosphere. The bits of dust and rock heat up to extreme temperatures and glow, creating the streaks seen during meteor showers. Meteors compress the air in front of them, which heats the air, and in turn, heats the bits of debris. When in space, bits of space material — like the debris that creates the Lyrid meteor shower — are known as meteoroids. As they streak through the atmosphere, they are called meteors and any bits of rock that make it to Earth's surface are labeled meteorites. Editor's Note: If you snap a great photo Lyrid meteor shower that you'd like to share for a possible story or image gallery, send photos, comments and your name and location to managing editor Tariq Malik at spacephotos@space.com.